I finally gave in and bought a gnocchi board. Had I known it was going to cost me less than $10, I probably would have given in a long time ago. I really do have an unhealthy addiction to kitchen tools and cooking supplies. If my mom wants to treat me for my birthday, she knows we're going to the local restaurant supply store. If the boyfriend wants to cheer me up, he knows something that says KitchenAid has a bigger impact than flowers, though I still love flowers (just in case he's reading this). While my kitchen is larger than any that I've had before (since living on my own), it's still small in the the grand scheme of things and certainly doesn't have the room to house my addiction. That seems not to matter as my purchasing has yet to be limited by the question, where will I put it? Anyone else out there share my addiction? What is your weakness when it comes to kitchen gadgets? By the way - if you click on the photo it will take you to Sur La Table where you can get your own gnocchi board! How cool is that?! 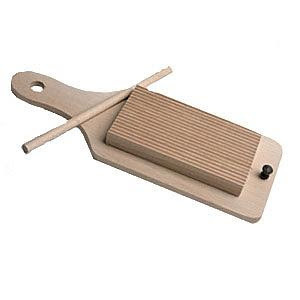 A gnocchi board. I am starting to becoming an addict but trying to control my spending! Penny this is my first gnocchi board. I've been wanting one for awhile, but this is the first! Meg - join the club! Oh, sign me up too! I mean, I don't know if I want help for my addiction, but my apt-sized kitchen thinks I need it :-) So how does a gnocchi board help prepare gnocchi (I'm totally ignorant in the gnocchi dept...)? My weakness? Knives. No matter how many I have, I can't help but to ogle them. My current obsession? Those mesmerizingly shiny (and VERY sharp) Shun knives from Japan. Congrats on the gnocchi board. It looks very simple to use and like a lot of fun! Hi Jessica, I came across your blog through adopt a blogger and I love it so much I am adding it to my blog roll! My favourite kitchen gadgets and I do love my gadgets are my potato ricer, my pineapple twister and my mango splitter. With all the questions about the board, I will definitely make gnocchi sometime soon to demonstrate the process. The board is used for shaping the gnocchi after you get them into small pieces. The goal is to get ridges on one side (from the board) and to make a small indentation on the other side (with your thumb as you roll the gnocchi). If I'm not mistaken, the ridges and indentation help sauce stick to the gnocchi. Anyway, gnocchi again soon! Never seen this before, thanks for sharing, it looks a bit like the chinese violin "Yee Woo". I never knew these existed but now I want one! Alice's Barber ShopFox Avenue Salon is a full-service beauty, hair and nail salon in the San proud of our premier downtown location and our prestigious beauty and hair salon. I have over 100 photos on my iPhone that the phone took itself, and I don't want to have to go through each and every one and email it to my computer. Is there an easier way to transfer them? I need to restore my phone because it's acting up, but I don't want to lose all the pictures on it.